We’ve just been looking at the history of toilet facilities in and near Church Lane, off Spurriergate, so it’s as good a time as any to alert readers to the planned demolition and rebuilding of the public toilets near Bootham Bar. Etty has them in his sights here as he looks from his Exhibition Square vantage point. Caring about toilet facilities can I guess look a bit small-minded and petty. We should have our minds on higher things perhaps. But as we all know, it’s impossible to have your mind on higher things if you’re desperate for the loo. 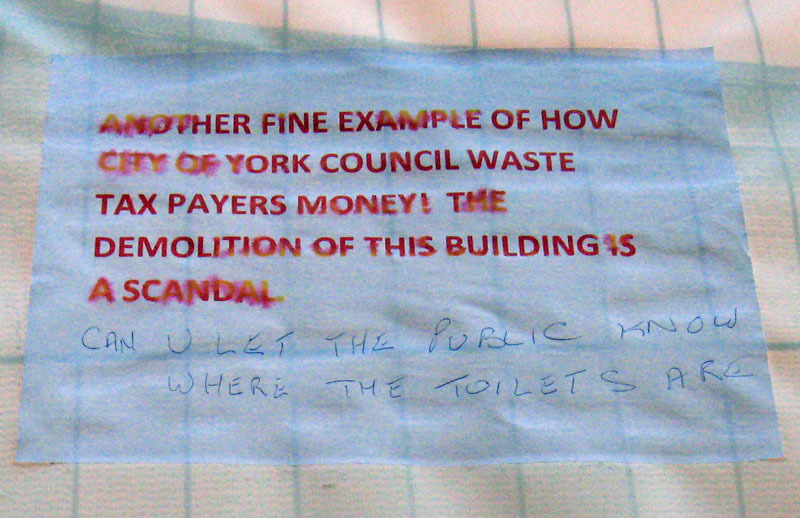 And basic things like toilets and bins are things York residents and visitors alike care about. As was illustrated some time back by this sign on the site of the ‘Splash Palace’ — a toilet block on Parliament Street demolished in recent years. Note the desperation in the note added in blue biro. The Bootham Bar loos — well, I’m only familiar with the ladies half — are scruffy and have definitely seen better days. They’re nice and light, but that’s about the only good thing I can say about them. Oh, and you don’t have to pay to use them. I imagine we will once they’ve been rebuilt. Sounds reasonable, doesn’t it. Better, even. What immediately occurred to me, as someone who once had a cleaning job involving some toilet cleaning, is that I would imagine anyone employed to clean the place would say ‘demolish them and build something easier to clean’. On the other hand, if the changes mean the current cleaners lose their jobs, then they might think differently. So many things to think about, regarding one little public toilet facility. And then there’s the fact that it’s right next to one of the city’s most important monuments, and has a bit of Roman wall underneath it, and so everything has to be carefully scrutinised and approved by English Heritage. 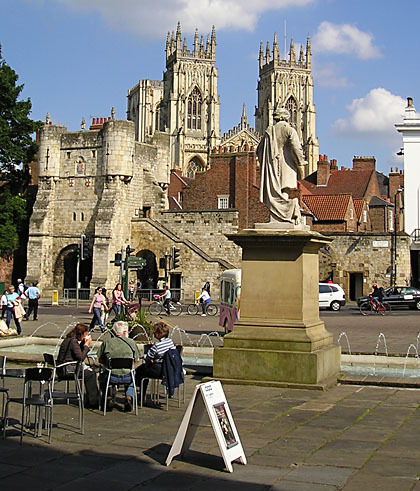 Hugh Murray’s book Where to Go in York gives a historical perspective and makes it clear how the number of public toilets has been reduced in recent decades, both in the suburbs and the city centre. The history of public convenience provision tells us a lot about wider changes in society. By 1900 York city centre was well provided with basic facilities (urinals) for men, but only one public convenience was provided for women. Many of the urinals were placed at the ‘entrances’ (or exits) to the city — near the bars and posterns. Later, as motorised transport became more popular, they were located in the car parks, where several remain. Here’s a photo from the city archives of Bootham Bar before the toilets were built. 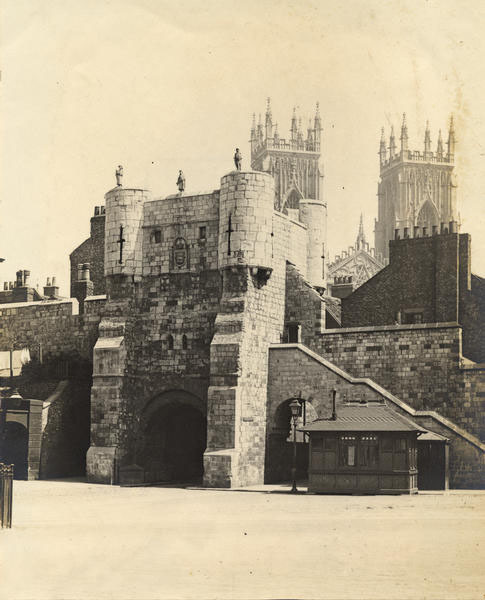 The notes accompanying this image in the York Images collection explain that the small building alongside the road is a cabman’s shelter, and the small structure against the wall behind it is a urinal. The men’s toilets were built at Bootham Bar in around 1930, and rebuilt after the war, when women’s toilets were also added alongside, in what was Milburn’s Yard. The City Engineer had earlier suggested that the ladies loos could be located underground in Exhibition Square, under the Etty statue, with Etty’s plinth serving as a ventilation shaft. Poor old Etty. Hugh Murray’s book ends by asking whether the provision of public toilets is adequate for a city with so many visitors. Several more have closed since it was published 14 years ago. Certainly the smell in many of the city’s alleyways and doorways suggests we should perhaps go back to the Victorian idea of widespread urinal provision. According to the council’s website, all the public toilets are closed at 8pm. In a city with so many people out drinking in the evenings, until the early hours? Gwen Swinburn had seen the site notice for the proposed demolition and mentioned it on Twitter. I searched on the planning access pages for the application documents. Searching for what most of us would I think call ‘the toilets at Bootham Bar’. This didn’t yield any results. I tried ‘Bootham Bar’ and ‘St Leonard’s Place’, both of which seem logical. On that photo above, the street sign for ‘St Leonard’s Place’ is directly above the doorway of the ladies loos. But no, they’re listed as ‘Public conveniences, Exhibition Square’. And on the council’s information page as ‘St Leonard’s Place (Exhibition Square)’. If they’re being redesigned, how about renaming them too? They’re not actually in the square, but they are next to a massive great gateway called Bootham Bar. Such things are important and would assist residents like me who often get stopped by lost visitors trying to find things like toilets. Anyway, enough about toilets. I’d rather write about trees, and hope to do so soon. In the meantime, comments welcome. Please discuss among yourselves while I ‘powder my nose’ and check no one’s excavating under Etty.